I knew going to Sochi was going to be physically demanding. London was hard, but I at that time I was still in recovery mode from my run in with the SUV in 2011. This year after my triathlon race season had wrapped up in mid-November I made a commitment to myself to get in shape, with the lofty goal of being Not Bad for an Old Guy! With the help of my friends from Core Power Yoga in Edina, MN I was there 5 days a week for the next 13 weeks! I know what you are thinking, I do not quite match the typical demographic of the yoga practitioner and OMG – He’s Wearing Yoga Pants! But with the help and support of some great instructors and friends; and the fact that working alone they were the only human beings I got to see during the day, I made it. After 3 flights over 2 days and over 6,000 air miles, I arrived in Sochi without too much physical stress. I had gotten a good night’s sleep in Moscow and had a couple of good meals. I was now rested and ready to go! I was lucky enough to get a ticket and as such, my first event was the Opening Ceremonies. Scheduled to begin at 8:14 PM (20:14 duh) at first sounds like an easy day. However I had to be at the USOC office to get my ticket at 2:00, which since I was unfamiliar with transit times, I left my apartment at 11:30 AM. Ultimately we had to be in place at Fisht Stadium by 5:00 PM before the public was allowed into the venue. The good news is that I was with a great group who I would have the privilege of seeing at varies venues over the next two weeks. The bad news was we had to go up 10 flights of stairs, down eight, back up five flights, walk through a tunnel and then finally up to our position. Of course I was carrying all of my gear, except my laptop which I left locked at the media center. Little did I know this was the warm up for what would become the norm for the week. Arrive early, haul equipment and climb stairs. I know what you are thinking here – what if you had a party, invited the entire world and well, no one showed up? Nope, I didn’t get to see the lighting of the torch, it was outside and I was inside! We finally got out of the stadium after 11:00 PM and decided to walk back to the Media Center since the buses would have probably taken longer! It was a long walk at the end of a long day! I transmitted a few images, picked up my things from my locker and headed to get the bus back to the mountains. Keeping in mind it is my first day, I asked for bus TM10 to Gorki and the smiling volunteer said – you can also take TM5, so I did. As it turned out, TM5 just drove in a 20 minute loop to the hotels around the Olympic Park and returned to the Media Center. At this point I was far to exhausted to be upset and well, what good would it do? I found TM10 back to the Gorki Mountain Media Center and transferred to TM13 to my hotel. When I asked the transportation volunteers how long until TM13 arrives, they said 10 minutes. Funny thing over the 2 + weeks I was there, it was ALWAYS 10 minutes; never 5, never 15 – always 10 minutes. Finally just after 2:00 AM, I collapsed! The next day was my first day at the Laura Biathlon & Ski complex. This was much more convenient, a 15 minute walk through security to the Krasnaya Polyana cableway (and yes it is pronounced just like that, but my iPhone auto-correct kept changing it to Polly Anna). More on Security later, but I took the big cableway (20+ capacity) to a smaller cableway (6 capacity) to the top of the venue. It was really pretty easy. Easy until I got off the cableway and looked up at the stairs I had to climb to get to the venue. 10 flights, yup I counted them! 10 flights of stairs and I had made one critical omission. I had somehow neglected to consider the venue was DUH – on a mountain and instead of the my Minneapolis normal 800 feet above sea level, I was now at almost 5,000 ft! I started walking up the stairs at my normal pace and after a few flights I felt like I was going to explode! Couple more flights, more of an explosion! Hot, sweaty, dehydrated and sucking wind! I was able to gather myself together, get in position to shoot the Cross Country event, and then back to Biathlon to get ready for the evenings race. Post event, I was totally oblivious to how far I had walked earlier – I was sure it was about 7 miles. I asked if there was a bus to the cableway. Of course! I took MX1 to the cableway. Just one problem, different cableway. Which ultimately ended in much discussion to find another bus and a late night 30 minute walk carrying all of my gear back to my apartment! This is only day 2! I think it was day 4 when I realized that I was working at altitude (there was a reason they called it the Mountain Cluster – previously I was thinking Cluster was the key word), from there I just climbed the stairs more slowly, used my yoga breath and could make it up all 100 flights (oops, I mean 10) without a problem. For the next couple nights, it was a quick and easy trip down. However on the 3rd night, I could no longer take the 10 flights of stairs directly down to the cableway, I now had to take an 18 minute side trip up and down hills through slush and ultimately up 5 more flights of stairs to get to the same spot. Why you ask? The ubiquitous answers to any question like this is: Because this is Russia! As the games progressed I was able to find ways to conserve my energy, mostly by using the Media Transportation System, often more connections but less physical stress. It really shouldn’t be a surprise that I actually left Sochi in better shape than I arrived, although I was doing pretty well when I arrived. You know, Not Bad for an Old Guy! My re-entry was a 7:30 AM yoga class about 12 hours after getting home and an afternoon massage. Since I have another 26 hour travel day coming up next week, I have been at yoga every day since returning. Just to put your mind at ease and so you will allow young children to possibly look at my blog, I do NOT wear yoga pants! Spirit Of Triathlon Photo Contest Prize List! Our 2nd Annual Spirit of Triathlon Photo Contest (click for details) is in full swing and in addition to our photo related prizes, we have added a few prizes for your favorite triathlete. Grand Prize – The photographer of the winning image will have the opportunity to join me at one of my 2014 events. Although I cannot guaranty that you will be able to be credentialed for the event, I will work with you to plan your shots, angles and locations. In addition, I will do a pre-race review and critique of 20 of your images via email & Skype, so you can start working on optimizing your shots and practice prior to our event. I am shooting all across the US so hopefully, my schedule will be close to you so you can join in the fun. First Prize – The first place photographer will receive a ThinkTank Photo Retrospective 30 camera bag – great stuff, trust me, you will love it. Third Prize is a Retrospective Lap Top Bag. Tri Prizes – For the apparel and shoe prizes you will receive a coupon so you can get the proper size and color! From Profile Design T4+ Carbon Aero Bars in their new matte finish. 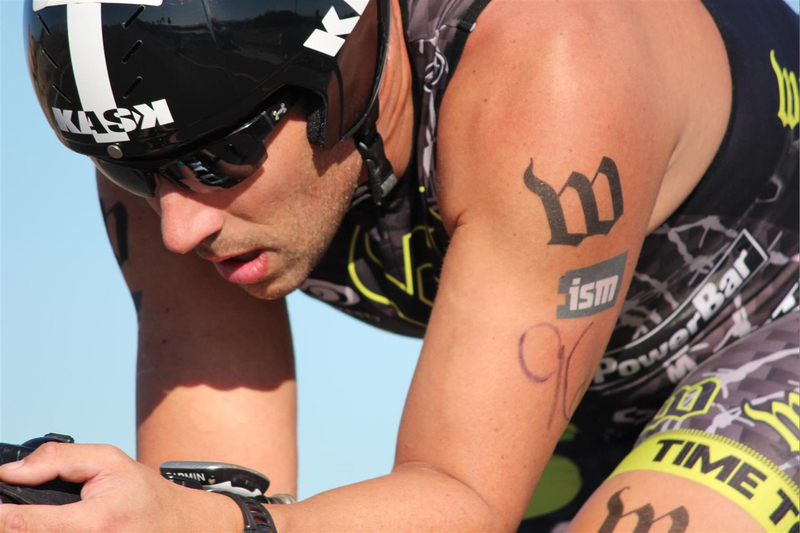 Check out what Aaron Hersh of Triathlete Magazine had to say about them. One Body Paint Tri Kit for Men and one for Women. One Free Tri Kit for Men and one for Women. One Cylcing Kit (Inferno Bib Shorts / Climber’s Jersey) for Men and one for Women (Scarabocchio Short / Scarabocchio Bavet Top). Here is a quick look at one of everybody’s favorite Castelli sponsored triathlete. Two-time World Champion Mirinda Carfrae. Well, we cannot promise that you will go as fast as Rinny, but you are going to look really good! Castelli sponsored Mirinda Carfrae at the 2013 Ironman Oceanside 70.3. From K-Swiss Your choice of shoes. From TriTats Three of the top photos will each be awarded a TriTats Pro Pack. You will now be able to have great looking race numbers for your race photos. Take a look at how good this guy looks! Here is a secret about the TriTats Pro Pack – I keep one with me for photo shoots. We put on the race numbers prior to the race and get shots that look like race shots. The Crowie shot above actually was shot during the race! Finally, at least for now, our friends at Training Peaks are providing three 3-month premium subscriptions! I do expect a few additional prizes to come in. Our goal is that in addition to having the top 20 images in a Triathlete.com gallery, each will be awarded a prize as well! Get your images ready and sent in. ENTER HERE and after you enter, tweet your photo with the tag #SpiritOfTri. Images are starting to be submitted for the 2nd Annual Spirit of Triathlon Photo Contest and they look GREAT! From my perspective, one of the benefits of submitting your images in addition to the chance to win some great prizes is the opportunity to have your images critiqued. I hope you will gain some insight as to what will differentiate a good photo from one that will make people stop and take a closer look. Today I have selected three dramatically different images. The first image is from Allan Torres who is a physician living in San Juan. 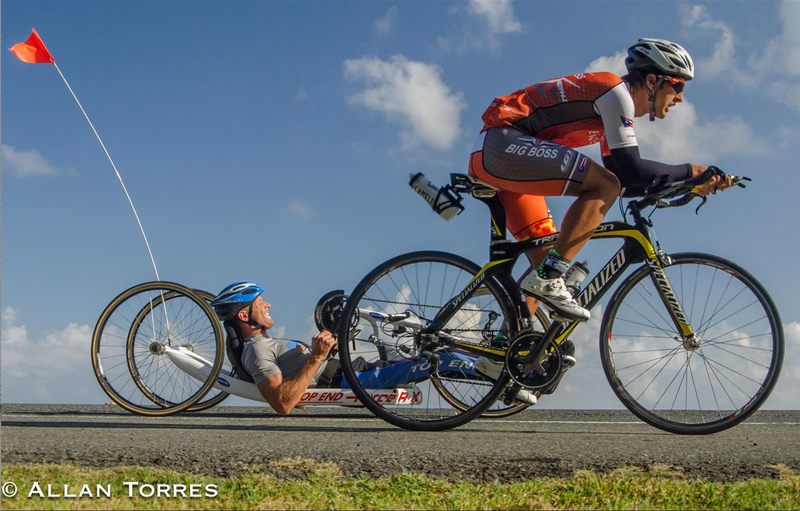 I had the chance to meet Alan at the Ironman San Juan 70.3 in 2013. There is a lot to like about Allan’s photo which he titled Fair Competition. First I like the low angle of the shot which really prevents us from seeing an excessive amount of asphalt and treats us to blue skies! Finally and most importantly is the content, the amazing juxtaposition of the challenged athlete with the age group athlete. As I always say, Every Shot is a Lucky Shot, but the better you prepare the luckier you get. Here Allan had picked a great angle, great background and then had the patience to wait for a great shot to present itself! This next image, entitled Focus was submitted by Chris Masilon from California. While Chris’s composition is good and the show of intensity, the problem is that in spite of the title, the focus is not quite sharp enough. With tight images such as this, it is critical that the focus be spot on with a sufficient depth of field that can clearly convey the intensity of the image to the viewer. In Chris’s shot, the logo on the helmet has the sharpest focus, but then it falls off as it gets to the athlete’s face. In all fairness to Chris – this is a really tough shot! Finally from Aussie Dennis Tan, here is something you don’t see everyday. I have never been down under, so I am not sure if a Unicorn holding an umbrella to stay out of the heat is normal there, but based on my US and European events, I haven’t seen it. What can I say, this one is just plain fun and the black and white looks great. We have some great prizes – I will be posting the updated prize list shortly. In January 2013, we started to the Spirit of Triathlon Photo Contest. The goals were fairly simple with the thousands of triathletes racing every weekend and the hundreds of thousands of photos that have been shot; we hoped this would be an opportunity to show off the amazing efforts and spirit of the all of the athletes involved in our great sport, as well as the photo efforts of the athletes many supporters. As the submissions arrived and I started reviewing images in my blog, an additional goal presented itself. Using real world examples, I could offer comments and critique on how to enhance your race images with some relatively simple solutions and provide you added value to your photo and race experience. While the athletes you are supporting are out for hours at a time, you can work on your photo skills at the races. Not only telling their story, but doing a great job of preserving the memories of their amazing accomplishments. Athletes, supporters and bloggers, here is your chance to show off your favorite triathlon photos, have it published and win a great prize! Images may include Professional, Age Group, Youth and Challenged Triathletes, Action Photos, Venues, Human Interest and other images that exemplify the Spirit of Triathlon. The numbers of triathletes and events continue to grow at an amazing rate with no let up in sight for 2014. In addition, we are approaching a billion photos posted each day on Social Media – it is time for some great shots and their photographers to get the attention they deserve. Our top three images will again receive prizes provided by my friends at ThinkTank Photo. This year I am adding a Grand Prize as well! As every triathlete knows a great coach can make a huge difference in your performance, it is true of sports photography as well. The Grand Prize winner will have the opportunity to join me at one of my 2014 events. Although I cannot guaranty that you will be able to be credentialed for the event, I will work with you to plan your shots, angles and locations. In addition, I will do a pre-race review and critique of 20 of your images via email & Skype, so you can start working on optimizing your shots and practice prior to our event. I am shooting all across the US so hopefully, my schedule will be close to you so you can join in the fun! The contest will begin today, January 9, 2014 and conclude on March 9, 2014. In addition, each week I will review three photos in a blog offering comments that I hope will benefit all triathlon photographers. Be sure to follow us on Twitter @CompImagePhoto and check out the Competitive Image Website. Just to get you started here are a couple of my 2013 Kona shots that show the Spirit of Triathlon. In the spirit of triathlon, a portion of the proceeds from each entry will be contributed to the Blazeman Foundation for ALS and to World Bicycle Relief. In 2013 30% of the proceeds from entry fees was contributed! Every event that I shoot I rely on my ThinkTank gear to have my critical equipment close at hand. In addition to having your image published in an online Triathlete.com gallery, the first place photographer will receive a Retrospective 30 camera bag – great stuff, trust me, you will love it. Second Prize is a CityWalker 10 and third prize is a Retrospective Lap Top Bag. Just a personal note about the ThinkTank Retrospective series. No matter what event I travel to and how much gear I take with me, I always, ALWAYS bring my Retrospective bag with me. It is the PERFECT bag for walking around shooting. Easy access and unobtrusive! You will love it. We are currently gathering up a list of other Tri related prizes to be included hoping that each of the top 20 images will receive something. More details will be available on a future blog post, but we currently have commitments from Training Peaks, Profile Designs, K-Swiss, TriTats and Castelli. Last year there were a number of questions about the contest that popped up on social media and I am sure there will be more this year. In the meantime, I will try to respond to a few of the questions. Who owns the images after they are submitted? You do! Although the top 20 images will be presented in a gallery on Triathlete.com and perhaps in a print issue, you will still own the images and all of the rights to the use of the images beyond the single use presentation on the web and in print will be controlled by you. Why is there an entry fee? There are two primary reasons for having an entry fee. The first is simple, I use outside software to administer the contest and process the entries, and there is a real cost for each entry submitted. Second and more importantly, reviewing, evaluating and blogging about the entries takes a substantial amount of my time. Although I enjoy this process, this contest is not about having thousands of cell phone images or post race selfies to look at. I am serious about the contest, and I hope you will be too. Here is the fine print so to speak! The Contest Rules! The sole contest sponsor is Competitive Image, Inc. PO Box 19174, Minneapolis, MN 55419 (“Sponsor” or “CI”). The 2014 Competitive Image Spirit of Triathlon Photo Contest begins January 9, 2014 at 9:00:00 a.m. US Central Time and ends March 9, 2014, 11:59:00 p.m. US Central Time (the “Contest”). Information on how to enter and prizes form part of these official rules (“Official Rules”). By submitting an entry, each entrant agrees to the Official Rules and warrants that his or her entry complies with all requirements set out in the Official Rules. This is a skill-based contest and chance plays no part in the determination of winners. Contest is open only to all amateur sports photographers who are 18 or older at the time of entry and is void where prohibited. For these purposes we will define Amateur as those individual who do not make a significant portion of their income from photography. This will allow individuals who maintain blogs and have periodic sales to participate. Each Entry consists of an entry form, a single image, and an entry fee. The entry fee is US $12 for the first image entered and US $7 for each image thereafter. To enter, complete an ENTRY FORM with the required information, including your name, address, telephone number, email address, and photo caption; and submit along with your photograph and fee in accordance with the instructions that follow. Submitted images may include Professional, Age Group, Youth and Challenged Triathletes, Action Photos, Venues, Human Interest and other images that exemplify the Spirit of Triathlon. Photographs must be in digital format. Only online entries will be eligible. No print or film submissions will be accepted for entry into this Contest. The photograph need not be taken with a digital camera; scans of negatives, transparencies, or photographic prints are acceptable. All digital files must be 2 megabytes or smaller, must be in JPG, TIF, PNG or BMP format, and must be sized to 1,280 pixels on the longest side. Photographs must have been taken within three (3) years before the date of entry and may not previously published. Watermarks are not acceptable. If Sponsor does not receive a non-watermarked version of the entry within ten (10) days following its request, the entry will be disqualified. If the photograph contains any material or elements that are not owned by the entrant and/or which are subject to the rights of third parties, and/or if any persons appear in the photograph, the entrant is responsible for obtaining, prior to submission of the photograph, any and all releases and consents necessary to permit the exhibition and use of the photograph in the manner set forth in these Official Rules without additional compensation. The top 20 images will be published in an online gallery on Triathlete.com. The entrant provides Competitive Image, Inc and Triathlete Magazine / Competitor Group the royalty-free right to publish the images on line and in print for a single use of each. Grand Prize – On location shooting and coaching with Paul Phillips, award winning triathlon photographer and Olympic Photographer, London 2012, Sochi 2014. The First Place winner will receive a ThinkTank Retrospective 30. Second Place winner will receive a ThinkTank CityWalker 10. Third Place winner will receive a ThinkTank Photo will receive a Think Tank Retrospective Laptop Bag. All prized are provided courtesy of ThinkTank Photo.